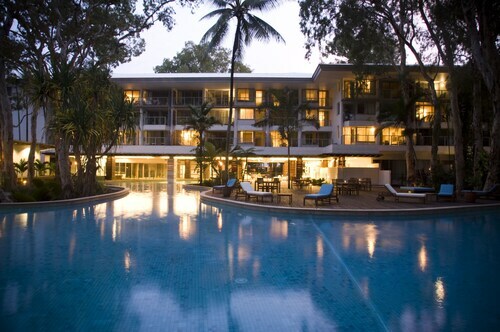 Nestled on the beach, this Palm Cove resort is 0.1 mi (0.1 km) from Palm Cove Beach and 2.5 mi (3.9 km) from Clifton Beach. Clifton Village Shopping Centre is 2 mi (3.2 km) away. 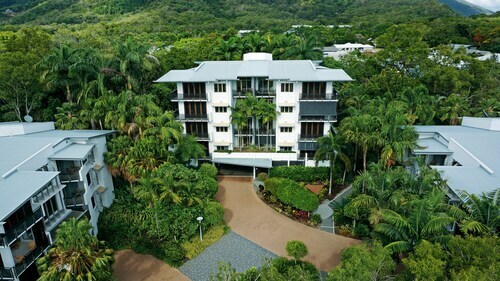 Located in Palm Cove, this beachfront apartment building is in the entertainment district, 0.1 mi (0.1 km) from Palm Cove Beach, and 1.9 mi (3.1 km) from Clifton Beach. Kewarra Beach and Clifton Village Shopping Centre are also within 3 mi (5 km). 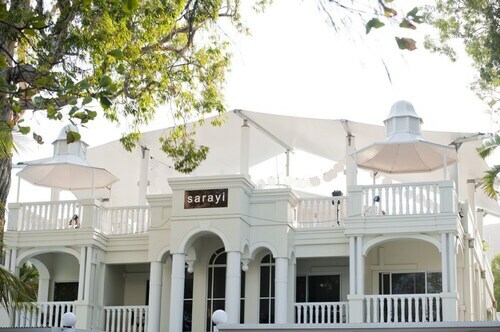 Situated in Palm Cove, this luxury hotel is 0.1 mi (0.1 km) from Palm Cove Beach and 2.1 mi (3.4 km) from Clifton Beach. Kewarra Beach and Clifton Village Shopping Centre are also within 3 mi (5 km). 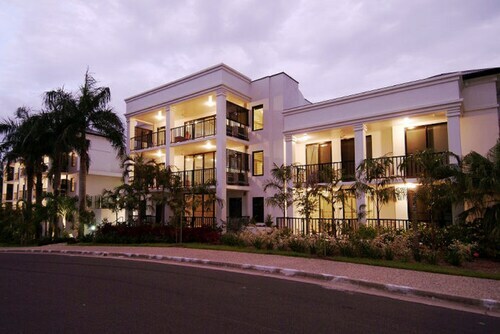 Nestled on the beach, this Palm Cove aparthotel is 0.1 mi (0.1 km) from Palm Cove Beach and 2 mi (3.2 km) from Clifton Beach. Kewarra Beach and Clifton Village Shopping Centre are also within 3 mi (5 km). 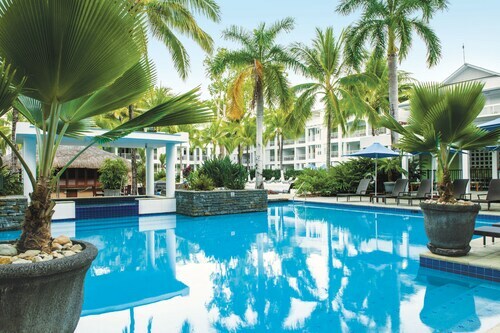 This family-friendly Palm Cove hotel is located by the ocean, within 3 mi (5 km) of Palm Cove Beach and Clifton Beach. Clifton Village Shopping Centre is 2.1 mi (3.4 km) away. 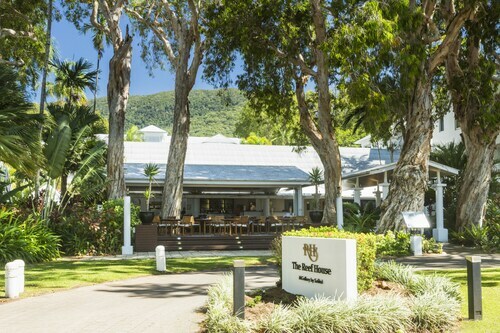 Located in Palm Cove, this beachfront hotel is next to a golf course and within 3 mi (5 km) of Palm Cove Beach, Clifton Beach, and Kewarra Beach. Skyrail Rainforest Cableway and Smithfield Shopping Centre are also within 9 mi (15 km). 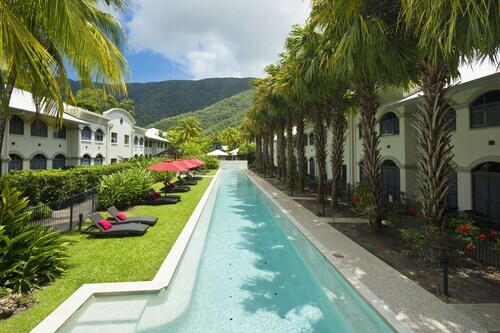 Situated by the ocean, this spa hotel is 0.8 mi (1.2 km) from Palm Cove Beach and 2.3 mi (3.7 km) from Clifton Beach. Clifton Village Shopping Centre and Kewarra Beach are also within 3 mi (5 km). 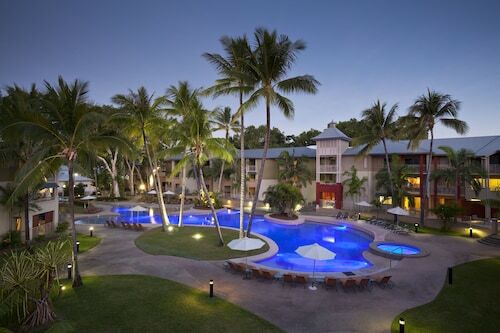 Nestled on the beach, this Palm Cove hotel is 0.1 mi (0.2 km) from Palm Cove Beach and 2.7 mi (4.4 km) from Clifton Beach. Clifton Village Shopping Centre is 2.1 mi (3.4 km) away. This family-friendly Palm Cove apartment building is located by the ocean, within 2 mi (3 km) of Palm Cove Beach and Clifton Village Shopping Centre. Clifton Beach is 2 mi (3.2 km) away. 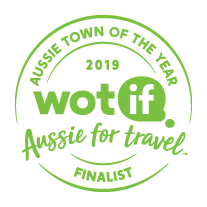 We’ve crunched the numbers, looking at pricing, demand and all-round awesomeness, and it’s official – Palm Cove, QLD, is a Finalist in Wotif’s Aussie Town of the Year Awards 2019. The Aussie Town of the Year Awards recognise top Aussie destinations that offer travellers great value for money, fantastic experiences and excellent accommodation options. With its beautiful long sandy beach with seasonal activities such as jet ski hire etc, plus also has some great dining choices, it’s obvious why Palm Cove was a top pick for the top ten. You don’t have to go far from Cairns for your next beach weekend. Just 27km to the north is Palm Cove, a tiny beach town that we’d call “quaint” if we were the kind of company that used words like “quaint”. But we’re not, so we’ll stick to words like “charming”, “secluded” and “peaceful”. Palm Beach is relatively small, but the strips of shoreline within reach are pretty darn awesome. We’ve done some preliminary exploring so we can point you toward some spots that are close to our Palm Cove beach hotels. Ellis Beach: Just north of Palm Cove itself is Ellis Beach. Wander down a quiet stretch of tan sand, the roar of the sea on one side and a blanket of palm trees on the other. You wanted peace and quiet? You got peace and quiet. Trinity Beach: You can spend all day splashing through the warm waters of Trinity Beach…or you can do some exploring. Snap some pictures of yourself looking bad-arse at the False Cape Battery—an old fortification dating back to World War II—or reenact your favourite Finding Nemo scenes during a snorkelling session. Palm Cove Beach proper is quite nice, if we do say so ourselves (and we do). From here, you can kick off an adventure at the Great Barrier Reef or tour the nearby rainforest. Or you can stretch out on the sand. We won’t judge. The Reef House Palm Cove MGallery: Quick, you need to combine the charm of a boutique facility with all the stuff that makes a holiday special—like massages, a bar that operates on the honour system (yes, exactly) and oceanfront views, for starters. The Reef House has all of them, but be warned: Once you get here, you may never want to leave! BeachView Apartments at Villa Paradiso: “Paradiso” means “Paradise”, so you know from the start, these folks aren’t joking around. All of the rooms come equipped with a balcony that overlooks the Coral Sea, so you can hear the gentle thud of the surf even when you aren’t rolling around on the beach itself. This place is downright idyllic—what more can you ask for? We’ve showed you around the local beaches and picked out some of our best Palm Cove hotels for you to stay in—the rest is up to you, mate. Book your holiday today and head for the Coral Sea tomorrow. Tell Nemo we said hello! Need insider tips on must-see attractions in Palm Cove? Check out our Palm Cove travel guide! How Much is a Hotel Room in Palm Cove? 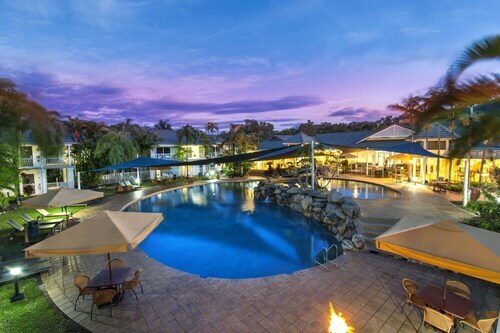 Hotels in Palm Cove start at AU$101 per night. Prices and availability subject to change. Additional terms may apply. We LOVED The Reef House. The rooms and facilities aren't super modern - but they're comfortable, well thought out & completely perfect for a tropical holiday. The staff are attentive, friendly & happy. What we loved the most was the unexpected little things that the reef house offers, the Brigadier Bar and the excellent conversations with Norm, The relaxed setting with chess boards, shared library of books and movies, afternoon sorbet around the pool, the fishing rods & push bikes - all there for our use. The continental breakfast was a delight & the restaurant served the best food we've had in a long, long time. We loved reading the history of the place as well! 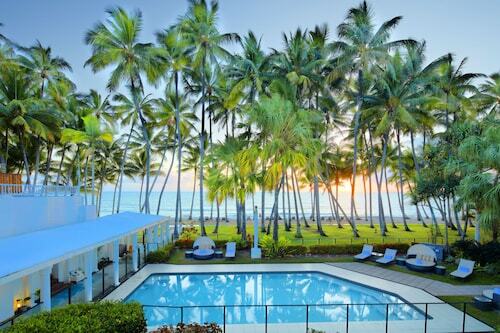 We felt that Palm Cove as a whole was an ideal place for couples. Take your kids to the GC - but take yourselves to Palm Cove, and in particular - The Reef House. We will absolutely return.